Some Moms plan trips to the park, while others plan a day full of crafting fun. Some will even take the spontaneous route and point to a spot on the local map and plan a day around the winning location. No matter how Mom chooses to plan and spend the days, she fills with life’s lessons and love. This year, send Mom a unique gift that suits her one-of-a-kind personality; here are some creative Mother’s Day gift ideas to satisfy your special Mom! Mom spends countless hours tending to her garden and indulging in the bounty it brings her. Bring the beauty of the garden indoors with a confection-filled gift inspired by her garden! Our Cookie Flower Garden is filled with Cheryl’s famous Buttercream cookies and even comes with forget-me-not seed packets to add some beauty to Mom’s yard. If bathing suit season is Mom’s favorite time of year, send her a beachy-keen gift inspired by sandy shores like our “Life’s a Beach” cookie tin. The Mom who loves tradition and classic celebrations will be expecting flowers. Pair your fresh flower bouquet with an even sweeter floral gift like classically beautiful tulips – in cookie form! Mom is all about sophistication and elegance, so surprise her with a ceramic teapot to enjoy her afternoon tea! This classy gift comes with 9 buttercream frosted cookies so you can enjoy these together after Mother’s Day brunch! Mom is number one on speed dial not just because you love her, but also because she offers the best advice out of everyone you know. She always has the answer and loves spreading her knowledge with the world. Send Mom the a sweet gift inspired the wisest animal we know – sure to be a hoot! Is Mom’s mailbox overflowing with beauty catalogs and shopping offers? 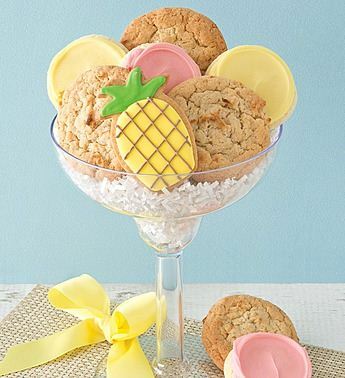 If she spends her lunch hours at the mall or shopping online, satisfy her taste for fashion with a chic cookie arrangement with a trendy twist! Even if Mom is on the other side of the world, you can still surprise her with treats at her doorstep! Make it a monthly gesture by surprising her with a subscription to the Cheryl’s Frosted Cookie Club – sure put a monthly smile on Mom’s face. She’s early to work every day, head of the PTA and still manages to be a full-time Mom! 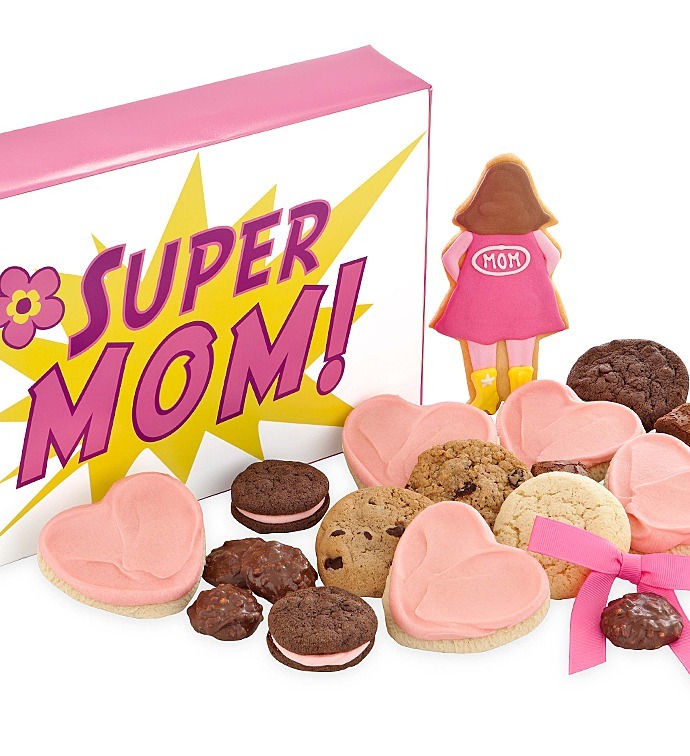 Send this super Mom a snack assortment worthy of a super-hero to show appreciation and love. Mom spends weekends volunteering and always makes sure to clip her box tops, so send this humanitarian Mom a gift that gives back. Our Make-A-Wish gifts give back about 20% of proceeds with each purchase from the collection! Mom never stops giving her family all she’s got, so why not surprise her on Mother’s Day with a gift that’ll keep on giving back to her? A fresh batch of Cheryl’s cookies beautifully arranged in a fun, reusable package is a doubly sweet gift idea: The scrumptious treats will make her tummy happy, and the handy container will make her life easy. Here are five totally practical Mother’s Day presents that’ll last long after the cookies are gone! 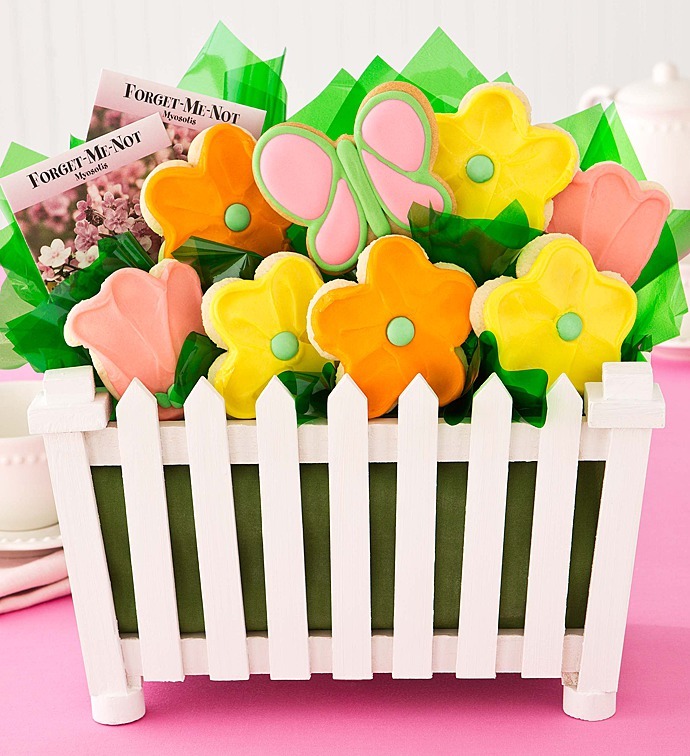 Any mom with a green thumb will love this one: Treat her to a dozen yummy flower-shaped cookies and help her keep her real-life flowers looking great! This sugary arrangement comes in a pretty metal watering can that your mama can use to water her garden. Or, she can turn it into a vase for fresh flowers and display it as a centerpiece on her dining room table! If anyone in the world deserves a delicious island getaway, it’s your hard-working mama. Aside from overflowing with tropical flavored buttercream frosted cookies, this durable plastic margarita glass also makes the ultimate party accessory. Next time your mom throws a BBQ bash, she can use the oversized glass to serve drinks or appetizers. Here’s a fun serving tip: For a chic hors d’oeuvre, Mom can hook shrimp along the entire rim of the glass and fill the center with cocktail sauce for dipping. This gorgeous keepsake ceramic basket doesn’t just hold 12 of Cheryl’s world-famous frosted cutout cookies. With a little imagination, it has tons of potential uses around the home! Mom can use it to serve bread or dessert at the dinner table, or organize small items like silverware or craft supplies. It’ll help keep Mom’s home tidy and add a refreshing spring touch to her décor for years to come! Packed to the brim with frosted cut-out cookies, snack-size brownies, sweet pretzel clusters and butter shortbread cookies, this pretty-in-pink basket is infinitely functional. Use these tips on packing the perfect picnic basket and head out for a Mom-and-me lunch in the sun, or check out these 30 different uses for baskets from 1-800-Baskets.com for even more savvy ideas! This tasty bouquet of Cheryl’s buttercream-frosted cookies and candy sits in a metal bucket that’s not only cute as a button, but also super-efficient! Mama will have a blast discovering all the different ways she can use it indoors or outside. She can fill it with ice and turn it into a mini cooler for drinks, pack it with soil and convert it into a flower pot, or make it a caddy for anything from gardening tools to kitchen utensils. So which practical Mother’s Day gift will you be surprising your mom with, and how will she use it to simplify her life? How are you planning on showing Mom you care this Mother’s Day? Flowers? Jewelry? Homemade card? Or perhaps with a delicious gift from Cheryl’s? Share with us your special plans for Mom and we will reward YOU with a chance to win our beautiful Spring tin filled with buttercream frosted flower cookies! We will select 3 random winners. This is one of those crazy years when Easter and Passover were so late in April that they almost overlap with Mother’s Day. Just when we are putting away our Easter eggs and Matzos, we shift our thoughts to our mothers, wives and grandmothers. This year, Cheryl’s has put together a great assortment of cookie flowers for Mom. We have developed a line of unique gifts that feature our delicious buttercream frosted flower cookies in beautiful floral tins and boxes. My favorite product of the season is our Spring Cookie Flowers that come with stems, tissue paper and all of the fixin’s. This is one our most special gifts of the year. I also love our rose cookies that are hand frosted and come in our rose box. 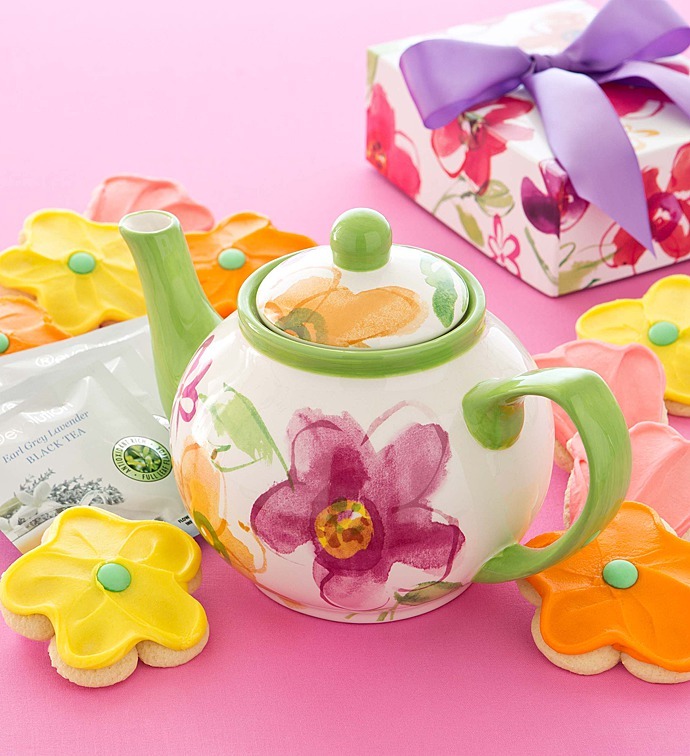 I hope this year we can help you deliver huge smiles to Mom with one of these tasty floral cookie gifts. What are we missing? What else would you like to see from Cheryl’s? I would love to hear about new flavors or ideas that our Product Development Chef Elisabeth can work on for next year!